This holiday is a great Northern Italian cooking and wine program that will be held in the Tuscany region with chef Paolo Monti. Work alongside the chef in the restaurant kitchen during this hands-on cooking program and learn the best of classic and contemporary northern Italian cuisine. Enjoy main ingredients and sauces class, an olive oil seminar and tasting, a traditional tuscan cooking class, and a fish and seafood class, all enriched by field trips to the wholesale market and the surrounding villages. During this holiday, you will stay in a private or shared double room at the Tuscany Sun Apartments in Lucca, Italy. The apartments are a quiet green paradise attached to chef Paolo Monti’s cooking school and are located on the first floor above the restaurant La Cantina Di Carignano. You can choose among four newly remodeled Tuscan style apartments, with terracotta tiles on the floor, wooden beams on the ceiling, wrought iron beds, cooking facilities, and modern comforts such as private bathroom, telephone, air conditioning, free Wi-Fi connection and a flat screen television. This is a two bedroom apartment of 40 square meters with view of the countryside. The apartment has a bath with tub, a kitchen with sink, two stoves and a fridge, a television, and air conditioning. It offers two large and comfortable double bedrooms. This is a large apartment with a balcony and view of the countryside. The apartment has a bath with tub, a kitchen with a sink, two stoves and a fridge, a television, and air conditioning. It has one double bedroom with the possibility to add a supplementary bed and sofa bed for two persons. This is a 30 square meters studio apartment with a fireplace and a separate bedroom. The apartment have a kitchen with sink, twp stoves and a fridge, a private bathroom with shower and television. It has one large and comfortable double bedroom and one chairbed for an extra guest. It offers the possibility of a sofa bed for two persons. This is a two bedroom apartment with a full size kitchen, a dining room, and view of the countryside. The apartment has a bath with a tub, a full size kitchen and large dining room. It offers large and comfortable double bedrooms. During this cooking program, you will learn the best of classic and contemporary northern Italian cuisine with five exciting modules led by chef Paolo Monti. You will start with the we will start with the main ingredients and sauces class, an olive oil seminar and tasting, a traditional tuscan cooking class, a fish and seafood class with, among other things, salmon and fresh tuna tartare. You will also have a risotto class with veal escalopes and carpaccios, a class on fresh pasta and ravioli making, pizza and focaccia, and soups as well. During this holiday, you will learn to prepare dishes with beef, pork, and chicken as well as desserts. All together are more than 60 recipes! The program is enriched by field trips to the wholesale market for fish, meat, cheeses, pasta, wines, oilve oils, among other ingredients. In this holiday, you will enjoy a wine tasting session at a local boutique winery and a very interesting day trip to Parma and Modena provinces to see the production of parmigiano reggiano. Upon arrival, you will check in at the Tuscan Sun Apartments in Lucca where you will be based during the holiday. You will get the chance to meet the other participants in the lobby at 7:00 p.m. for aperitifs, followed by a welcome dinner with chef Paolo Monti. During this day, it is suggested to have a light breakfast because you will make 14 recipes and taste all of them. At 9:45 a.m. you will have a hands-on cooking lesson with chef Paolo Monti followed by lunch. This class is very important, you will start with a lesson on the origins of the Italian cuisine, the main ingredients, fresh herbs, an extra virgin olive oil seminar explaining how extra virgin olive oil is made, and taste a dozen different olive oils to recognize the differences, according to where they are produced. You will then start cooking some of the most important sauces of Italian and Tuscan cuisine followed by an afternoon excursion to Lucca and a guided tour of the city. Then, you will return to the hotel for dinner. Early in the morning, you will have a trip to see the fish and vegetables market to learn about the Italian vegetables, herbs and fruits, salami and cheeses, but mainly to learn how to recognize fresh fish. You will see different types of fish and what they are used for. Then, you will return to the hotel and start the cooking class with Italian seafood recipes. In the afternoon, you will visit a local winery for a wine tasting session. This day, you will enjoy dinner with local Lucchese specialties. You sill start this day with breakfast at 6:15 a.m. and then depart to the Parma province to visit Bertinelli Parmigiano Reggiano dairy to see the production of this totally organic and wonderful cheese, followed by tasting the finished product of course! You will then drive to Langhirano a prosciutto di Parma maker, see how prosciutto is made in a Prosciuttificio La Perla. You will visit the factory and see all the steps to produce this wonderful ham, followed by lunch with prosciutto, salami, and home made fresh pasta with Lambrusco wine! After lunch, you will drive to Modena to Acetaia Malpighi and visit the barrel rooms where the original aceto balsamico tradizionale is made, an ancient tradition going back to the Roman times. You will return to Lucca for dinner. After breakfast, you will start a hands-on Tuscan cooking class about its typical cuisine. You will make crostini ai fegatini, crostini alle melanzane, and panzanella, the famous Tuscan bread salad. You will hand make the local vegetable ravioli and a delicious aromatic meat ragù from Lucca with unusual spices, for the main dish which will be the arista di maiale that consists of a loin of pork with typical tuscan herbs. For dessert, you will make cantuccini also known as biscotti. During the afternoon, you are free to relax, perhaps with a bicycle trip along the river, or free to walk around Lucca. You will enjoy dinner at the Paolo Monti Cooking School restaurant. This will be an entertaining class for all the family! The art of making the perfect pizza, focaccia, and bread dough. You will make all the favorites such as margherita, amatriciana, pepperoni, funghi, prosciutto crudo, anchovies, and olives pizza. You will also learn to make two types of focaccia, and for dessert, you will also enjoy pizza. At 10:00 a.m. you will enjoy the final cooking class with chef Paolo Monti. You will be learning how to make a proper risotto with shrim and saffron, porcini mushrooms, red wine radicchio and speck, and squid ink. You will prepare also two types of traditional beef as well as carpaccio and a buffalo mozzarella cheese with a blended of fresh tomato sauce. To finish, you will make two desserts, semifreddo al croccantino and charlotte di pere. Then, you will have a free afternoon for shopping and additional activities followed by the final farewell dinner with chef Paolo Monti with a presentation of certificates ceremony. During this day, you will check out and depart. This holiday includes several visits and excursions to nearby villages and factories that will enrich your experience and understanding of Italian cuisine. During the holiday, you will enjoy an afternoon excursion to Lucca and a guided tour of the city. You will visit the barrel rooms where the original aceto balsamico tradizionale is made at Acetaia Malpighi at Modena. In this holiday, you will experience a trip to see the fish and vegetables market and visit a local winery for a wine tasting session. You will also enjoy a tour to the Bertinelli Parmigiano Reggiano dairy in the Parma province to see the production of this totally organic and wonderful cheese as well as a drive to Langhirano, a prosciutto di Parma maker to see how prosciutto is made in La Perla factory. This holiday will take place at Lucca, Italy. 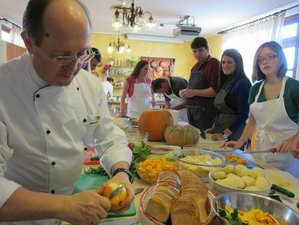 You will take the cooking lessons at the Cucina Italiana cooking school which is located in the middle of the Tuscan countryside among the fields and Sangiovese vignards and only five minutes drive to the center of Lucca. The town is recognized for its wonderful art and is nowadays still surrounded by the Renaissance walls that had defensive purposes in the past. It is considered like a jewel box that contains all the architectural beauties set on the city plan. The park of the Serchio River creates a connection space between the town of Lucca and the river watercourse on a area of 250 hectares of width, where it is possible to go for a walk, to make excursions by foot, by bike or riding a horse, canoeing or kayaking, or even just have a break along the banks to enjoy the view of the natural beauties. There also are several recreational areas, such as football fields, archery fields, an area for playing bowls, model airplane and model car fields, as well as skateboarding ramps. In this holiday, you will be served three daily delicious and gourmet meals. Upon arrival, you will enjoy a welcome dinner with chef Paolo Monti and before you leave, you will enjoy a farewell dinner. Throughout the holiday, you will savor a typical Tuscan style cuisine in La Cantina Di Carigano restaurant which is over 100 years old, with a great atmosphere, offering a local traditional cooking. Meals may include wood fired oven pizzas, charcoal grilled steaks, and great fish dishes. The restaurant offers a charming terrace open during the summer season. During your free time, you are welcome to enjoy additional activities such as a horse ride through Lucca and its surroundings, perhaps take a bicycle trip along the river, or discover the Tuscany region, take a language lesson, play tennis in the nearby tennis court, go shopping to Lucca's downtown, or just relax and create time for yourself. Turn left into Viale Europa. At the roundabout, take the 2nd exit and take Viale Carducci. Turn right onto Piazzale Luigi Boccherini. Turn left to stay on Piazzale Luigi Boccherini. Continue straight onto Via Alfredo Catalani/SS439. Turn right and take Via di Sant'Alessio/SP24. Turn left and stay on Sant'Alessio/SP24. Take the second right to stay on Sant'Alessio / SP24. Continuing to follow Via di Sant'Alessio. Tuscan Sun Apartments are on your left. Continue straight onto Via Città Gemelle. At the roundabout, take the second exit and take Via Gaetano Luporini. At the roundabout, take the second exit and take Via Luigi Einaudi. Turn left and take Viale Giacomo Puccini/SS439. Leave the motorway at the exit 'Lucca Ovest'. Please book your flight to arrive at Galileo Galilei International Airport (PSA). You can also choose to arrive at the Peretola Airport (FLR). Available to start any month of the year with arrival on Sunday.